This is my new and improved brew method. All of the equipment from the previous method still applies. So many disconnects it still makes my head spin. A whole mess of tubing. About 12' is what I use. Less can work fine, just depends on your space constraints and whatnot. Plate chiller. This replaces the immersion chiller I used previously. I drilled a hole in the top of the cooler lid just big enough for the silicone tubing to fit through. I then secure a siphon sprayer to the tubing with a hose clamp. If you notice the wire going into a copper tube there, that's my ghetto thermowell for the temperature probe on the ITC-308. Not entirely necessary far as I know, I just figured since I was hacking up my old IC I could reuse part of it for that. So what happens in this setup is fairly simple. Once the water is transferred (dumping or pumping under, whichever I feel like doing) to the mash I begin recirculating. It recirculates from the bottom of the mash tun through the copper coil immersed in hot water on the pot on the burner. It is then returned through the top of the mash tun. Repeat for an hour. Or however long I feel like it. The ITC-308 monitors the temperature of the mash (hence the thermowell for that probe). 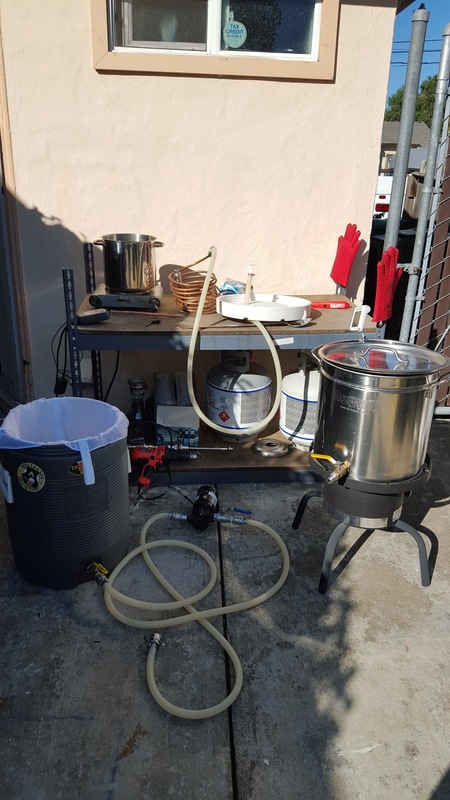 Based on that, it controls the burner to heat (or not heat) the water in the pot which will control the temperature of the wort being returned to the mash. Heat Exchanging Recirculating Mash System. Hooray! Is it more work than my previous method? Yes! But it's also a more consistent way to brew. Everything is more controlled and it allows me to dial recipes in very easily. I love it. 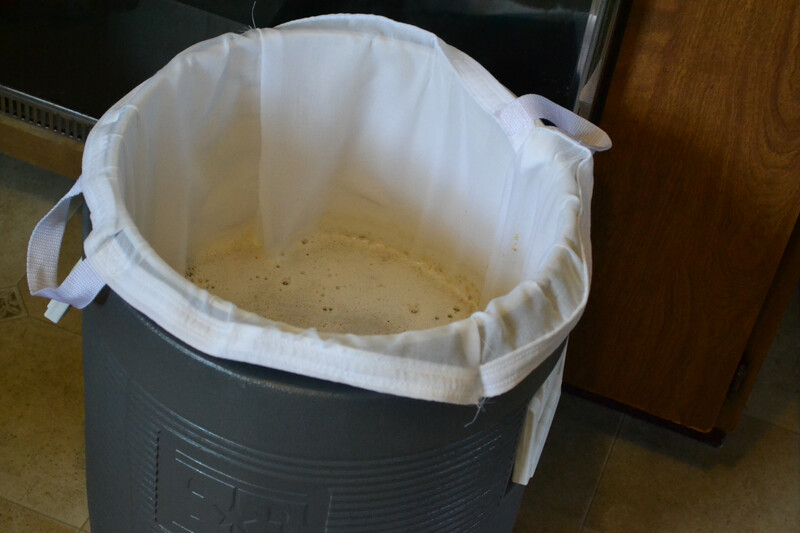 I posted my Mash In A Bag blog up on 8/8/14. 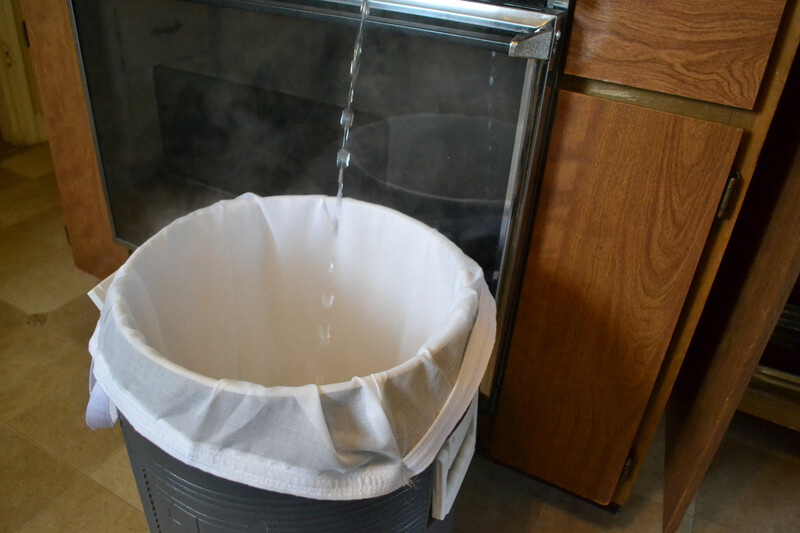 While several people that saw it at the time on reddit and elsewhere commented that they've done either similar or the exact same thing, the vast majority were perplexed by the idea of mashing in a cooler, in a bag. First and foremost allow me to say: I do not intend this to be a "replacement" for any method. If you're happy with your method, more power to you! This is intended to outline my personal brewing method so that anyone else could do the same. First I'm going to outline my equipment, because it's important to understand what is required before doing this. Bayou Classic 1036, 36-Qt. Stainless Fryer/Steamer. Perfect size for heating water and boiling, all I need it to do. I drilled a hole and installed a weldless valve/spigot kit but this is not strictly necessary by any means. 11.7 Gallon Cooler with ball valve and spigot. The one I use is purpose built, but any similar cooler will suffice. This custom made bag. The quality of the bag is essential. If the mesh isn't fine enough, it simply won't save you much time on vorlauf or allow you to mill super fine. A coarse mesh will drain faster, but it will also allow far more grain particles through. Not ideal. Any bag will work, but a quality bag will work better. Simple enough. I use a standard 6.5gal fermenting bucket to collect first runnings if I'm going to batch sparge. Otherwise I simply drain off into the kettle from the cooler. Heat strike water & mill grain. Pretty self explanatory and necessary for any brew day. Once the strike water is in, add the grain and stir like crazy. Do your best to make sure there are no dough balls in there, and to distribute the heat as evenly as you can. Cover it up. I personally stir every ~20 minutes during the mash unless I forget, and then less. This is personal preference as some people prefer not to disturb it for an hour, while others will stir every 10-20 minutes. I found that temp loss over an hour varies by about 1F whether or not I stir every 20mins. Drain first runnings. I vorlauf to get clearer wort out of there, but I can't seem to get a picture of it. Why? Because with the bag I use it takes less than a second to start running clear. I use my refractometer to get a gravity reading because it's fun to know, but this isn't necessary. Lift bag & twist as you do so. This will drain the wort out of the grain in the bag quickly. Slide a rack (I use an oven rack) between the bag and cooler, set bag on rack. Allow to drain while first runnings run off into bucket or whatever vessel you're using to collect them in. Batch sparge. First, remove rack and set bag back into cooler. Add predetermined volume of water at 170F and stir that mash like it owes you money. Seriously, beat it up. Then cover it up and leave it alone for 10-15 (or 30... whatever) minutes. Repeat the stupid fast vorlauf for the second runnings. I pour the first runnings into the boil kettle and run these into the kettle as well. I also get a gravity reading on second runnings, though again not necessary. Lift, spin and use the oven rack again to drain remaining wort. I like to slide a bucket under the spigot to catch the last bit while I put the kettle on the stove to heat to a boil. 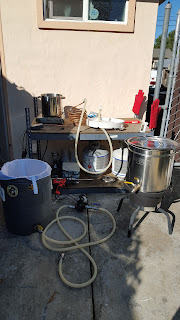 Add whatever ends up in the bucket after 10-15 minutes of draining while I do other things and then dispose of or use the grain in other ways. Now you just boil and add hops as usual. What I've described above is a fairly typical all grain brewing procedure, just in a bag. Disposal of grain is very easy. 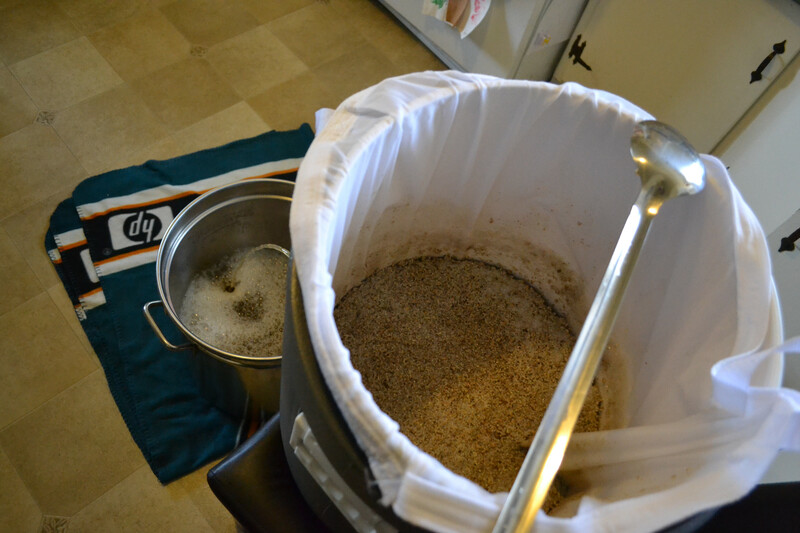 It's also impossible to get a stuck mash or sparge this way, because the bag acts as such an effective filter. 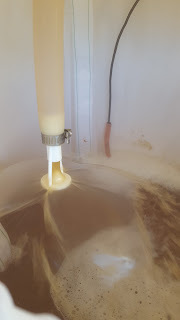 You also end up getting more wort out of the mash than you would without a bag, because you can do as I do and lift/spin the bag to get the most out of it. While not necessary, I like doing it because otherwise waiting for the wort to drain out of the kettle slower is just not something I have the patience for, and I would hate to waste any of that sweet delicious wort. The only practical negative to this method is lifting the bag. I do not have any issue with this, but I can easily understand how others might. If you want to use this method and can not lift the bag full of wet grain, you have two simple options. Option 1: Grab a pot lid and smash it down rather than lift it up. Just make sure the vessel catching the runnings is positioned properly so that if wort squirts out abruptly it won't get everywhere. Or just press slowly, that'd work too. Option 2: A simple pulley would get the job done nicely if you'd prefer to lift, but are not able to do it yourself. Sous Vide Supreme... Why Not HERMS?